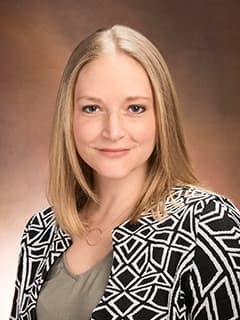 Laura E. Dennis, BA, is a clinical research coordinator in the Division of Human Genetics and Mitochondrial Medicine at Children's Hospital of Philadelphia. Dennis LE, Wohl RJ, Selame LA, Goel N. Healthy Adults Display Long-Term Trait-Like Neurobehavioral Resilience and Vulnerability to Sleep Loss. Sci Rep. 2017 Nov 2;7(1):14889. doi: 10.1038/s41598-017-14006-7. Dennis LE, Spaeth AM, Goel N. Phenotypic Stability of Energy Balance Responses to Experimental Total Sleep Deprivation and Sleep Restriction in Healthy Adults. Nutrients. 2016 Dec 19;8(12). pii: E823. doi: 10.3390/nu8120823. Ng., T. H., Titone, M. K., Dennis, L. E., Goel, N., & Alloy, L. B. (2017, September). A preliminary test of the Social Zeitgeber Theory. Abstract for presentation at the Thirty First Annual Meeting of the Society for Research in Psychopathology, Denver CO.
Dennis, L. E., Ecker, A. J., & Goel, N. (2017, June). Individuals show differential vulnerability in neurobehavioral and affective responses to stress and sleep loss in non-laboratory conditions. Abstract for presentation at the meeting of the American Academy of Sleep Medicine and the Sleep Research Society (SLEEP), Boston, MA. Dennis, L. E., Spaeth, A. M., & Goel, N. (2017, June). Energy balance responses show phenotypic stability to sleep restriction and total sleep deprivation in healthy adults. Abstract for presentation at the meeting of the American Academy of Sleep Medicine and the Sleep Research Society (SLEEP), Boston, MA. Dennis, L. E., Ecker, A. J., & Goel, N. (2017, January). Individual differences in neurobehavioral and affective responses to stress and sleep loss in 14-day and 30-day HERA mission crewmembers. Abstract for presentation at the Human Research Program Investigator’s Workshop 2017, Galveston, TX. Dinges, D. F., Basner, M., Mollicone, D., Ecker, A., Jones, C. W., Mott, C., Hyder, E. C., Di Antonio, A., Dennis, L. E., & Kan, K. (2017, January). PVT on ISS: reaction self-test (RST) from 6-month missions. Abstract for presentation at the Human Research Program Investigator’s Workshop 2017, Galveston, TX. Dinges, D. F., Basner, M., Strangman, G., Stuster, J., Mollicone, D., Roma, P. G., Gur, R. C., Stahn, A., Dennis, L. E., Ecker, A. J., Nasrini, J., Mott, C., & Williams, T. J. (2017, January). Behavioral core measures (previously SBMT): overview of data collection in HERA 30-day missions. Abstract for presentation at the Human Research Program Investigator’s Workshop 2017, Galveston, TX. Goel, N., Dennis, L. E., Ecker, A. J., Bhatnagar, S., Kirkpatrick, J., & Weljie, A. (2017, January). Biomarkers as predictors of resiliency and susceptibility to stress in space flight. Abstract for presentation at the Human Research Program Investigator’s Workshop 2017, Galveston, TX. Dinges, D. F., Basner, M., Goel, N., Rao, H., McGuire, S., Hermosillo, E., Dennis, L. E., Carlin, P. R., Trentalange, M., Lin, L., & Mignot, E. (2017, January). Markers of susceptibility to neurobehavioral decrements in space flight. Abstract for presentation at the Human Research Program Investigator’s Workshop 2017, Galveston, TX. Dennis, L., Frager, N., Taylor, A., Dinges, D. F., & Goel, N. (2016, June). Differential recovery of behavioral attention outcomes, but not other cognitive and subjective measures, after sleep restriction and acute total sleep deprivation. Abstract for presentation at the Society for Light Treatment and Biological Rhythms 28: 21, Berlin, Germany. Dennis, L., Frager, N., Taylor, A., Dinges, D. F., & Goel, N. (2016, August). Differential recovery of behavioral attention outcomes, but not other cognitive and subjective measures, after sleep restriction and acute total sleep deprivation. Abstract for presentation at the Military Health System Research Symposium, Orlando, FL. Dennis, L., Ecker, A., & Goel, N. (2016, February). Crewmembers show deficits and individual differences in neurobehavioral responses to stress and sleep loss in HERA 14-day missions. Abstract for presentation at the Human Research Program Investigator’s Workshop, Galveston, TX. Goel, N., Dennis, L., Ecker, A., Abel, T., Basner, M., Bhatnagar, S., Dinges, D. F., Kirkpatrick, J., & Weljie, A. (2016, February). Biomarkers as predictors of resiliency and susceptibility to stress in space flight. Abstract for presentation at the Human Research Program Investigator’s Workshop, Galveston, TX. Dinges, D. F., Metaxas, D. N., Zhong, L., Yu, X., Wang, L., Dennis, L., Ecker, A., Yu, A., Trentalange, M., Jones, C. W., & Basner, M. (2016, February). Optical Computer Recognition (OCR) of stress, affect and fatigue in space flight. Abstract for presentation at the Human Research Program Investigator’s Workshop, Galveston, TX. Dinges, D. F., Dennis, L., Trentalange, M., Ecker, A. E., Nasrini, J., & Basner, M. (2016, February). Standardized behavioral measures toolkit (SBMT): Self-Report Measures. Abstract for presentation at the Human Research Program Investigator’s Workshop, Galveston, TX. Dinges, D. F., Basner, M., Mollicone, D., Stuster, J., Strangman, G., Roma, P., Gur, R. C., Stahn, A., Dennis, L., Trentalange, M., Ecker, A., Nasrini, J., & Mott, C. (2016, February). Standardized behavioral measures toolkit (SBMT) overview. Abstract for presentation at the Human Research Program Investigator’s Workshop, Galveston, TX. Dinges, D. F., Basner, M., Mollicone, D. J., Ecker, A., Jones, C. W., Hyder, E. C., Di Antonio, A., Dennis, L., & Kan, K. (2016, February). Reaction self-test (RST) from 6-month missions on ISS (PVT on ISS). Abstract for presentation at the Human Research Program Investigator’s Workshop, Galveston, TX. Dinges, D.F., Goel, N., Basner, M., Rao, H., McGuire, S., Dennis, L., Allen, J., Trentalange, M. (2016, February). Markers of susceptibility to neurobehavioral decrements in space flight. Abstract for presentation at the Human Research Program Investigator’s Workshop, Galveston, TX. Dennis, L. E., Spaeth, A. M., & Goel, N. (2017, May). Energy balance responses show phenotypic stability to sleep restriction and total sleep deprivation in healthy adults. Poster presentation at the IDOM Philadelphia Obesity Research Day, Philadelphia, PA.
Dennis, L. E., Spaeth, A. M., & Goel, N. (2017, May). Energy balance responses show phenotypic stability to sleep restriction and total sleep deprivation in healthy adults. Poster presentation at the Center for Sleep and Circadian Neurobiology & Chronobiology Collaborative Retreat, Philadelphia, PA.
Dennis, L. E., Ecker, A. J., & Goel, N. (2017, May). Individuals show differential vulnerability in neurobehavioral and affective responses to stress and sleep loss in non-laboratory conditions. Poster presentation at the Center for Sleep and Circadian Neurobiology & Chronobiology Collaborative Retreat, Philadelphia, PA.
Dennis, L. E., Basner, M., Strangman, G., Stuster, J., Mollicone, D., Roma, P. G., Williams, T. J., Gur, R. C., Stahn, A., Ecker, A.J., Nasrini, J., Mott, C., & Dinges, D. F. (2017, January). Psychological self-report data in HERA: a component of behavioral core measures (previously SBMT). Poster presentation at the Human Research Program Investigator’s Workshop 2017, Galveston, TX. Dinges, D. F., Metaxas, D. N., Zhong, L., Yu, X., Wang, L., Dennis, L. E., Park-Chavar, S., Carlin, P. R. Ecker, A. J., Yu, A., Jones, C. W., & Basner, M. (2017, January). Optical computer recognition of stress, affect and fatigue in space flight. Poster Presentation at the Human Research Program Investigator’s Workshop 2017, Galveston, TX. Dennis, L., Frager, N., Taylor, A., Dinges, D. F., & Goel, N. (2016, June). Recovery of behavioral attention outcomes, but not other neurobehavioral measures, differs after sleep restriction and acute total sleep deprivation. Poster presentation at the meeting of the American Academy of Sleep Medicine and the Sleep Research Society (SLEEP), Denver, CO.
Dennis, L., Trentalange, M., Allen, J., Jones, C., Frager, N., & Dinges, D. F. (2015, June). An evaluation of personal characteristics as predictors of vulnerability to sustained partial sleep loss. Poster presentation at the Center for Sleep and Circadian Neurobiology & Penn Chronobiology Program Collaborative Research Retreat, Philadelphia, PA.
Dinges, D. F., Metaxas, D., Zhong, L., Ecker, A., Jones, C., & Dennis, L. (2014, October). Optical computer recognition of stress affect and fatigue in space flight, proof-of-principle in NASA’s human exploration research analog (HERA). Poster presentation at the National Space Biomedical Research Institute Advanced Technology Demonstration, Houston, TX. Dennis, L., Frager, N., Taylor, A., Dinges, D. F., & Goel, N. (2016, June). Recovery of behavioral attention outcomes, but not other neurobehavioral measures, differs after sleep restriction and acute total sleep deprivation. Oral presentation at the meeting of the American Academy of Sleep Medicine and the Sleep Research Society (SLEEP), Denver, CO.